Poutine – National Dish of Canada?! I have a number of Canadian friends and they know that I am into cooking. We trade barbs from time to time and half-jokingly I told one of them that I was considering a blog post called “Canadian Cuisine – Oxymoron or Not”. That produced some quick retorts like, “You really think you’re funny, don’t you? !” and “I’m surprised you Americans can even spell cuisine”. I knew that I had struck a nerve. Wikipedia, the usual source of truth and knowledge in the modern age, does have a posting for Canadian cuisine, but there is the following disclaimer at the top: “This article needs additional citations for verification. Please help improve this article by adding reliable references.” Does this mean the references they have are unreliable? I didn’t know, but this was clearly a red flag. 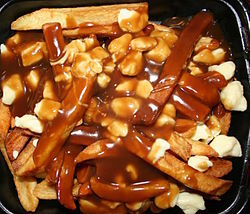 As I continued to read, I was surprised to see that the leading contender for the “national dish” is something called Poutine – a concoction of French fries (actually a Belgian dish – not Canadian) covered with cheese curds (which we all know is one of the anchor building blocks in the Wisconsin food pyramid) and topped with – get ready for this – BROWN GRAVY. Guys, is this the best we can do? Am I the only one having visions of people having heart attacks? The only thing I can say for certain is that it is a truly unique concoction. Further on in the article, they mention some other national favorites – Caribou stew, boiled fiddlehead ferns, and – my personal favorite – harp seal flipper pie. Wow, we are leaning towards oxymoron. However, we don’t want to rush to judgment so we will ask our Canadian friends to give us their best shot and send some examples and explanation of dishes that will convince us that we are not thinking clearly. The Canadian situation (and maybe the same goes for America) is due to waves of immigration, on the one hand, and a variety of indigenous populations spread out over a country that is 4,000 miles wide. The result is regional and ethnic dishes, but nothing that could be called a national cuisine. Anyway, I’m looking forward to some comments, especially on the Poutine. Someone must have some details on how to make this dish – it can’t be as simple as it sounds. I could say the same for American cuisine. I am curious to know what you would call American “cuisine”. What comes to mind when I think American would be burgers and hot dogs, not exactly gourmet either. I will say that I make a point of buying nutter butters and spicy cheetos whenever I cross the border. In my opinion, both countries have more or less adapted cuisine from other cultures to call “North American Cuisine”. Here’s my recent post on poutine and how to make it.